This is a post for Ashlynn. I am just thinking...maybe your rogue one dimple comes from another source? I don't know...I am just sayin...maybe? :) (Ok, so mine is hard to find in all the double chins and wrinkles, it's on my chin, not my cheek, and it's on the right side...but I am just sayin...you never kno.) Photo courtesy of Emma...nope, I am not deranged...just look like it today...ok, most days. 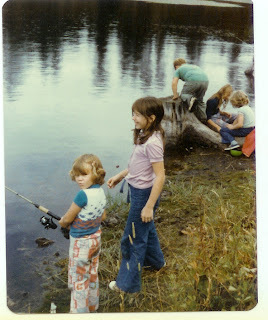 I just wish I could see the bottom of this photo...bet you I was wearing black leg warmers! :) Too funny. I bet we are saying "we are waaaayyyy to cool to be hanging around here, let's go do something totally tubular!" Happy Friday, all! Ok, so I will copy the idea of Friday Flashback...I have a doosey to post later today, but right now I am off to do my civic duty. Yep, you guessed 'er, chester! I have jury duty. Yikes. Pray for me. Usually, my fridays are a day of leisure...but today I am participating in our judicial process. Yeah, right. Happy Friday, all! Best thing you cooked last week? Crock pot BEEF roast. Moist and delicious. Love the crockpot! To Australia, with my girlie Kerri. Or to Iceland with JBird. Last night. Watching a soap. Seriously. 1. These are hard for me...I was a different person then. Working hard and paying bills to get ready for parenthood. 3. Having foot surgery, I think. If your maiden name began with Mc...yer it. So, as I sit at the keyboard, I am pondering the next few hours of my life. I usually reserve the 3:00 hour for bath and literature time. (I am totally serious. I almost always take a bath per day, and read my book or just let the jets run. I think it's because I have been colder than usual this winter, and am getting old and wimpy in my old age. I used to think coats were quite optional, even when we were reaching the below zero mark. Seriously.) Anyway, yes, my Robert James Waller novel, Border Music, is reaching an important climax, and I am anxious to see if our hero makes it back to Alpine, TX to his spread in one piece. (Phew, my comma typing finger is plum tuckered out.) So, I may go sit in the bath and explore the world of Texas a bit further, or I may go get something prepared for a nice dinner. Do you feel the pressure to prepare something nicer than normal for Sunday dinner? I do. Sunday is a blessing and a curse in that way for me. I think since I have all the time, I should prepare something fanicful, but since it's a day of rest, I think tuna sammies with bean and bacon soup should be quite sufficient. I have been wanting to post about my pork roast for some time. This seems like an appropriate juncture to do so. So, I was at my parent's house awhile back, and I went to the freezer to get some snobby ice. (Remember my post about "good" ice, the very important quality that ties Matthew McConaughey hey hey to me?) Well, I usually have a bag or two of it in the large, upright freezer outside. I went out to retrieve some, was bent over, and was absolutely LEVELED by a, let's see, 150 pound pork roast that slid out of the freezer and landed squarely on the back of my head. So, I instantly saw stars, felt sick to my stomach, and was cursing like a drunken sailor. Even to the point where my Mom got all huffy at me for my frustration. Ok, so sorry to take it out on her and all, but I was sort of nursing a major cranial hematoma, so I wasn't excatly at my best at that moment. Anyway, I lived and all was well. Enter second pork roast incident. I decided I would cook one that I had frozen. I laid it out in my small glass pyrex dish, and let it thaw. After work, I put the roast in the oven to cook. It was nearing side dish time, so I went in to start on the other parts of the meal and wondered why I hadn't smelled the pork goodness wafting out of the kitchen yet. I didn't think much about it, and instead just worked away on the other stuff. Finally, I thought I better check it, and when I opened the oven door, it was not even warm. It took a second for my brain to register. I hadn't turned the oven on. Phew. Smart one here. Guess it's Quizno's for dinner tonight. So, I put plastic wrap on the roast and put it back in the fridge. It's like money in the bank, isn't it? To have a plan for tomorrow night's dinner, and have it thawed and ready to roll? So, the next night, I threw it in the oven AND turned it on. Pretty soon I smelled something quite chemical and strange coming from the oven. Opened it and Voila!, it looked like shrink-wrapped and ready to mail pork roast. I forgot to take the plastic wrap off. Sheesh. This freaking thing was starting to scare me. So, thankfully the carcinogens hadn't penetrated the meat too badly (in my expert scientific opinion) , so I removed it and kept cooking! Eventually, it started to smell like roast and not like death in a brownie pan. Pretty soon, I decided there weren't going to be enough drippings for any gravy, so I thought I would add some water to the pan. Yep, you guessed it. Cold water, glass pan, bad combo. The pan shattered into a million pieces and the pieces penetrated through to the bottom of my oven. Morale of the story? Maybe I should not eat pork roast. Maybe pork roast has a diabolical plan for my demise? So, as I went to the fridge, my two pork related choices were chops and roast. I was afraid to choose. So, I blogged instead. I am ready to go choose now. Pray for me. Wish me well. Godspeed. Ok, suckas...how about these shots for a blast from the past? This is Andy...bottles in hand. 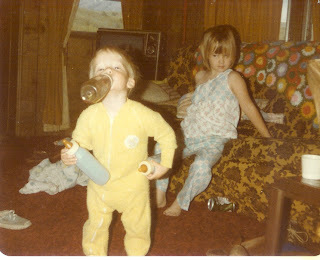 Always had a powerful thirst, I guess. ;) But, WTF with me in the background? Striking the Cosmo pose trying to steal Andy's thunder, I suspect. 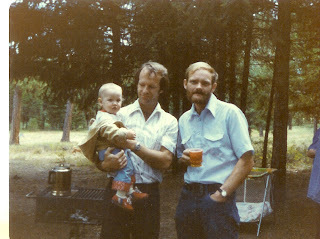 Three McCumber men at Bobby's Picnic. Cute shoes, Ricardo! Jenny showing us her slippers. Ain't she sweet? 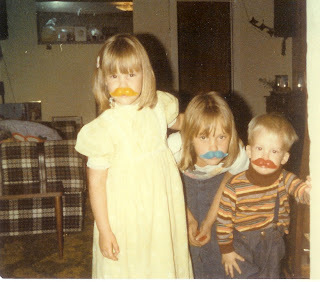 Those 'Cumber kids, they are in heavy disguise...maybe they are hiding from their cousins? Ok, you know how little children love the "big kids" around them. Not just love...they worship them... they watch their every move...hoping, dreaming and praying that they can some day be like them? Well, no surprise that Amy was my idol. I LOVED her hair. I knew God gave her different hair than mine, for hers was beautiful and short and curly, and mine, long and straight and lackluster. 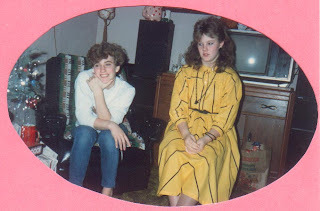 Well, in the late '70's and early '80's perms were readily available! Yay for me! 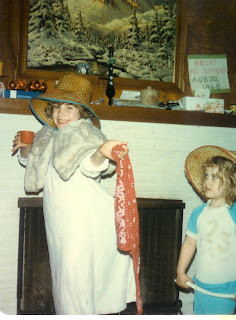 Lucky for me, too, that I had a Mom that would let me follow that star of someday morphing into Yma Rebmuccm. So, this is for you, Amy. Look closely at this photo. See my hair? See the cute little girl in the background with a green shirt on? See what I mean? Too funny! Guess what Amy? I still think you look amazing!!!! 1. When I get tired, I get scared really easily. Like, irrational scared. So, I spend alot of time lying in bed worried that I may not see the morning light. Not sure why. Once I finally figured it out, I now exercise positive self-talk. "Go to sleep, Sam. Yes, the closet door WAS closed when you laid down to go to sleep. You're tired. You will not be killed by a crazed madman. You will not be killed by a crazed madman." SO, it goes to show that I DO NOT read mystery/thriller novels before bed. 2. I like to cook, and I must say I am a pretty good chef. Two of my closest colleagues and friends have decided we will someday own and operate a women's retreat at Wallowa Lake, and I have officially been assigned chef duties. I have been mentally accumulating recipes to use for our venture. On one of our trips up to the lake, I served salmon cakes, and Peach Sangrias. Also, when I eat at a new restaurant, and if I eat something I LOVE, I have a hard time enjoying the meal, because I am dissecting it within an inch of it's life trying to figure out the ingredients and method of preparation. (I figured out an amazing pasta and prawn dish from Bugatti's and the Chicken Lettuce Wraps from PF Changs.) Yay me! 3. I love roller derby. I loved it when I was a child and I used to dream of doing it. I even remember a movie I was totally obsessed with when I was a kid. Can't for the life of me remember the name of it. I think I will do it someday before I am old and fragile. I have been accumulating some padding for quite awhile in preparation for my debut. 4. When I need to pee, my feet get really cold. 5. I love volkswagen beetles. I owned a aqua green one when I was in college, and I totally loved it. I love it still. I still see it from time to time around the streets of my town. My amazing cousin bought it, painted it, and then delivered it to me, and I had not even seen it. Thanks, JR. He is the shizzle. 6. I would LOVE to go to an icehotel. I love arctic culture, especially Icelandic life. I have done a good bit of research on the country, and it's absolutely fascinating to me. 7. I want to go into the woods and see how long I can survive...ala Survivorman. I think he'd be a dern good person to invite up to Jack Creek with us, or to Spring Creek. 8. I accidently sprayed deodorant in my mouth when I was little. I thought it smelled good, and I thought it may taste good, too. I then read the label, and was convinced I would die, like by the next day. I was so distraught I didn't know what to do, I remember thinking at the dinner table that night that it would be the last time I would have dinner with my family. I think I even worked a sort of "goodbye" speech in at some point. 9. I loved Ronald Regan. I sent him jelly beans in a snowman jar when he was shot. He then sent a thank you, and I became his little pen pal. I wrote back and forth with him a number of times. Are you inspired yet? How 'bout now? Now? No, not the fruit, but the voice in your soul that speaks out when you find something that you love. One of my favorite aspects of working in a University environment is witnessing, and assisting with, students experiencing that light bulb moment. The moment when they declare a major, or discover the path for the rest of their lives. It may sound cornball, but I am telling you...it's amazing. You meet these students when they are scared, lost and intimidated freshmen, and over their career you witness the metamorphosis into knowledgeable, informed citizens of the world. Pretty powerful. Really. During the middle of winter term (where we are now), the flow of students into my office has slowed, so it gives me an opportunity to read, research and develop new ideas for assisting exploring (or undeclared) students. 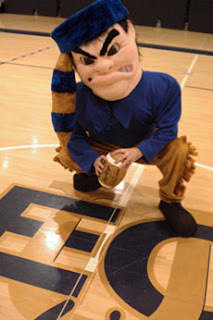 I ran across a website that discusses "college and character" - there was some really good reading in there. I believe most of the material was aimed at religious institutions, but I was quite inspired by some of the posts from students. (Reader says to self…Ooookayyyyy, Sam, bring on the point!!!!!!) So, on to my point...is it possible to have your passion be to inspire others to find theirs? Could be. It seems most of the time God gets my train of thought, and puts things in my environment that totally supports my line of thinking. Take Donny Deutsch (http://www.thebigidea.com)/ First, he's totally adorable. Second, ok...maybe he's a bit too much capitalist for me, but I think I am his soulmate. That's what he does. He inspires people. He has them reach for their passion, and follow their dreams and their hearts. Hey, he even had Matthew McConaughey on this week, and that dude's deep too. http://www.matthewmcconaughey.com/ His mantra: Just keep livin. I dig you, brotha, I dig you. (Sidebar...ok, Matthew McConaughey is bathwater-drinking adorable, but has a soul, and isn't afraid to use it! Plus...he loves GOOD ice! Me too, hey…maybe he's my soulmate too! He has a special icemaker in his house that dispenses crushed ice, because he is really an ice connoisseur. Weird. So nice to know you aren't alone in the world.) Anyway, quite noble work, if you ask me. Isn't that what we, as parents, are supposed to do as well? Teach your children to reach for the stars, and do everything in your power to build a ladder for them. I think another reason I am drawn to Donny Deutsch is because I am an inventor, and a designer way down deep. I am always jotting down ideas for new inventions, and am fascinated by that creative process. I even encouraged Emma to start her own invention book. It’s our little thing we share…pretty sweet. Ok, on to more important things. Funny story of the week: I was walking to work with my ubercoolcuttingedgepod, (howdayalikemenow, Darin!) aka, my ipod blaring in my ears, I think it was Carrie Underwear saaaanging, anyway...I was politely walking on my side of the sidewalk, tight against the left side when dude on bike decides to pass me, on the LEFT side. Ok, so he had like, 3/4 of a mile to pass on the right, but no, decides to scoot between me and the hedge on this icy patch of sidewalk. So, I, being the calm, composed and cool chick that I am, yelled "OOOOOOOHHHHHH". That's it. OOOOHHHHHH. Not a simple, fairly quiet poised OOOHHHH, but a "holy shcnikeys, all heck is breaking loose" sort of OOOHHHHH. Then I got the giggles. Said dude on bike is like, a long way away now and boy am I glad. I'm not really sure if that made any sense at all...I had a mocha and no breakfast this morning. Better go get some granola. Happy Friday, all! 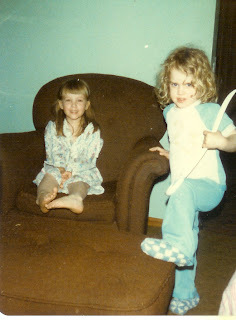 Ok, one last thing for today, my first day of blogging. Better post my most amazing achievement to date, these two gorgeous creatures God has blessed me with. They are my "raison d'etre" - my reason for being. Emma is passionate about animals. In particular, horses and hamsters. Check back for a future blog about two recent hamster deaths at our household. She is also becoming quite the fiddle player. Tristan is passionate about four-wheelers, the Pittsburgh Steelers and Transformers. He is the sweetest, most tender-hearted child I have ever met. What a hoot these little critters are! This picture was of the living nativity that some local churches put on in our town during Christmas time. What an amazing thing that was! It was freezing, but it seemed the whole valley had either turned out to enjoy the festival, or had contributed to organizing it. We walked through Bethlehem and learned about the night Jesus was born. What a wonderful opportunity to talk to your children about the true meaning of the Christmas season. They really loved learning about the Christmas story from the Bible, AND the camel. HE was a big hit. This is my first post. Ever. New to blogging. Gotta say, everywhere I look, I think...hey, I could blog about that..but alas, then I think - would anyone read about that, or would anyone care? Who knows. While my 5 year old son is in the kitchen un loading the dishwasher (no kidding), I will take a stab at it. Ok, so my big issue today is Winter. Usually I just love the snow. I love living in a region with four seasons, but I guess I am hoping the warm ones last more than a couple of months. We're under another winter storm advisory for today, and boy am I ready for some warm weather. I was just discussing the weather with our University president today, and she had been fielding emails and calls about the potential for closing campus. Sigh. It HAS been a relatively bad year, as my kiddos have had 2, count 'em 2 snow/wind days this winter. That's BIG for our valley. Huge. Anyway, see some of my pics taken today to get the drift. (Yes, pun fully intended.) BIG icicle, kids' snow cave and a bit of our blizzard. Happy Super Tuesday!